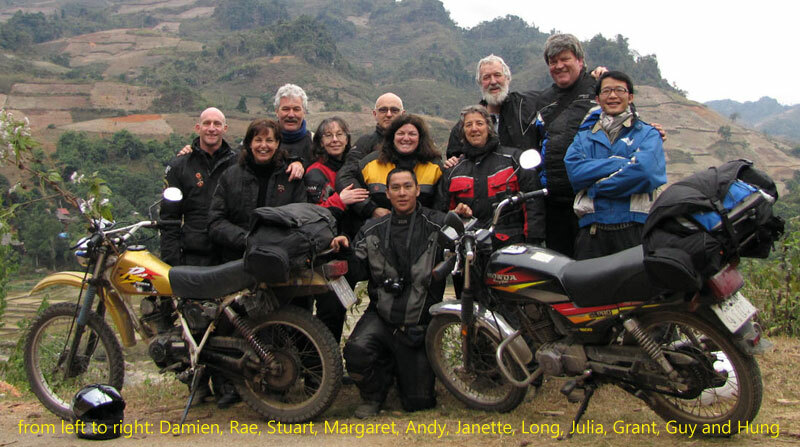 8 days in Northwest Vietnam: best riding holiday in my 34 years on motorcycles. Loved the variety of roads + the challenge of new kind of riding, including Hanoi. + Some long + a couple of short days. + Morning & afternoon tea stops. + lunches – not hurried. + No riding in the dark. 160cc luxury sport. No faults, good height for 5’4″ female rider. Good suspension, tyres, gearbox etc. Very easy to ride. Only required adjustment to back brake on day 7. + Home stays – all 3 very good (formal -> less formal in style). + Sunshine hotel ok, better to be closer to town for a more interesting walk in the evening. Too much like a Chinese hotel lobby – not comfortable. Rooms ok.
+ Palace (where the dam is being built). Interesting: liked it but bit run down – lights not working etc. Keep overall – GREAT. + Sapa – very good accommodation. Fine. I will eat anything except chicken feet, very happy. Smooth. Strong + effective leadership. Hung showed good concern for the riders at the back. Cheerful, always. Very excellent tour leader. Fine. Happy to pay more.